A fading beauty, in my yard. The sky is really blue and it's 90 degrees in the afternoon. 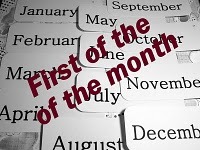 When you sign in with mr. linky, be sure you're linking your 1st of the month post; not your blog address. That's such a lovely shot. I love that bright blue sky! What a beautiful shot! I love the colors and the POV. My favorite of all your FOTM rose photos, Jan. Just that little bit of decay reminds us that soon they'll be gone for another year. But maybe not for you in CA? I posted this morning and then got busy and didn't get by to sign up. Hey... I still have some blooms in my yard which is exciting for Nov 1 here in the cold Valley. I'm always sad to see the roses go--but 90*, you can't complain about the weather. Have a nice day. So pretty! Wish we were able to see roses blooming, we're having rain mixed with snow today. Love all the wrinkles in your rose. Can you send us some warmth? It's getting colder and darker here. That rose is just gorgeous, against that beautiful blue sky - WOW fabulous shot.